Acupuncture is a restorative treatment that has been shown to help alleviate acute and chronic conditions and is invaluable for the prevention of future ailments. Acupuncture works by inserting needles into specific acupuncture points based on your condition. In order to understand how sticking a needle into the body can help heal, you must understand the concept of meridians and qi (pronounced "chee"). There are 12 meridians that run throughout the body. 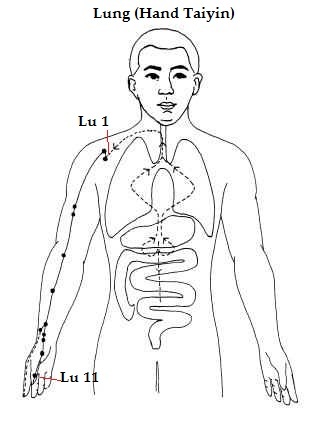 Each meridian starts and stops at a certain location in the body and has numerous acupuncture points along the way. For example, the lung meridian begins in the chest and ends near the fingernail of the thumb. Qi is what is contained within each meridian. To understand better, think of a river. The qi is the water and the meridian is the river bed. The water will flow freely unless there is some external factor, such as a huge rock, preventing the smooth movement of water. Qi works in a similar way. If the qi is disrupted by an internal or external source (trauma, emotions, chemicals, poor diet, allergies) the qi will not flow adequately and this over time results in disease. By needling distinct acupuncture points along different meridians, we can unbind the blocked qi which allows your body to repair and your condition to improve. At Modern Chiropractic and Wellness Center, we have a state of the art program that objectively measures your qi. With this program, we are able to graph the amount of qi in each meridian. As a patient you will be able to see your graph and track your improvement. As practitioners, we will be able to deliver precise treatment based on the measurements we obtain, resulting in quicker outcomes!